This has been one of the most unfairly maligned breeds throughout modern history. Its journey began around 400 years ago in Western Europe. While France lays claim to its development as a water retriever, both Germany and Denmark also are in the mix. These two or three breeds first created the standard poodle (much larger) which was then breed down for the toy and miniature poodles. The traditional cut was created to allow ease of swimming while protecting the legs and body from extreme cold and sharp reeds. The miniature poodle is one of the top three most intelligent dogs in existence and also have the skills of: retrieving, agility, watchdog, competitive obedience, learning tricks. The one thing that these tasks have in common is the need for high intelligence and stamina. The poodle is most known for its intelligence and ability to be highly trained. They are a great companion dog and can be very happy with a willingness to please their owner. They are very bonded to their family which means they must be an inside dog. With intelligence comes an inquisitive mind that must be satisfied. Unless walked daily this intelligence can quickly be dulled into boredom which has led to the ‘snappy poodle syndrome’ that the press seems to enjoy passing on. Their sensitivity when they are neglected can turn to nervousness and not trusting strangers and children (who often play inappropriately with dogs). They are rarely aggressive but boredom and lack of exercise can lead to problem barking and severe separation anxiety. Poor breeding control has led to some poodle lines having numerous health problems. Some of these are cataracts, Anaemia, heart disease, diabetes, epilepsy, skin infections etc. However responsible breeders should limit these issues. Owners of the miniature poodle become very dedicated to the breed and rarely swap. 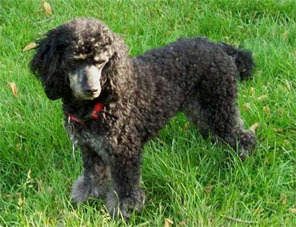 Miniature poodle size: 28 – 40 cm, weight 7-8 kg. Miniature poodle grooming: Unless you are showing a poodle, its grooming can be relatively simple compared to many non shedding dogs. The coat is either curly or corded but both are one of the lowest shedding coats of all dogs. For pet owners, the main requirement is to bathe them regularly, and clip them every six to eight weeks to prevent knots. One of the most common poodle health issues is skin allergies, which can quickly lead to ear infections. Wax build up and hair build up keep the canal moist which promotes fungal and bacteria growth. You can buy ear washes that are usually a mild acidic solution, and pluck ear hair with special tweezers. A raw food diet, and Omega 3 supplements can also be used to keep a miniature poodles skin allergies at bay. The miniature poodle’s intelligence and sense of fun, coupled with their retriever ancestry makes them a fun and faithful family dog. Just ensure that grooming maintenance is maintained and you will have one of the best dogs in the world in your family.